This may seem like a long list of ingredients and complicated method, but this is a really simple dish. It’s a one-pot meal and takes about 45 minutes to make. 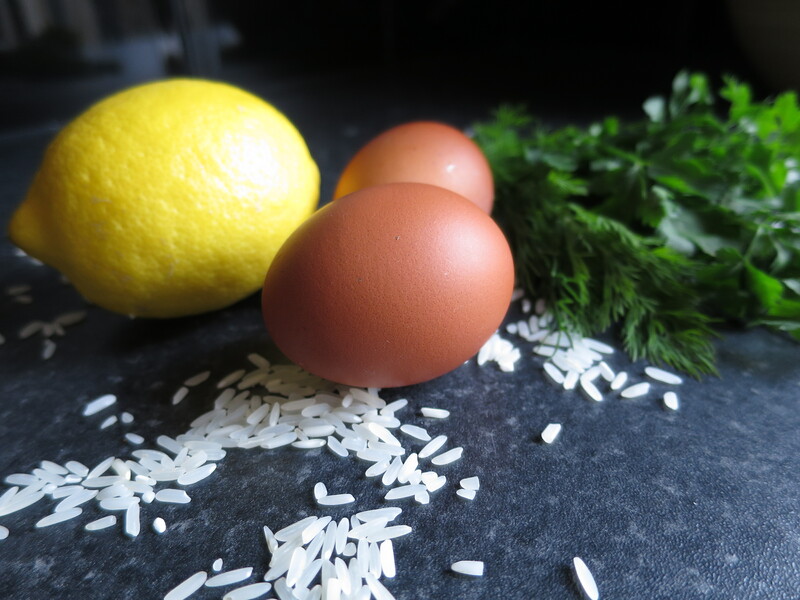 A little care needs to be taken when making an egg and lemon sauce, as it can curdle if heated to quickly. The trick is to add the hot stock to the eggs slowly, beating all the time. A good bit of advice is to make sure at least 90% of the stock is beaten into the eggs before you put it back in the pan, as it stabilises the temperature. 150gm uncooked long grain rice (raw) – I use the ‘Easy Cook’ variety available in most supermarkets. 750ml vegetable stock – ‘Marigold’ vegetable bouillon works well. A splash of tomato juice – see the list of ingredients for the meatballs. 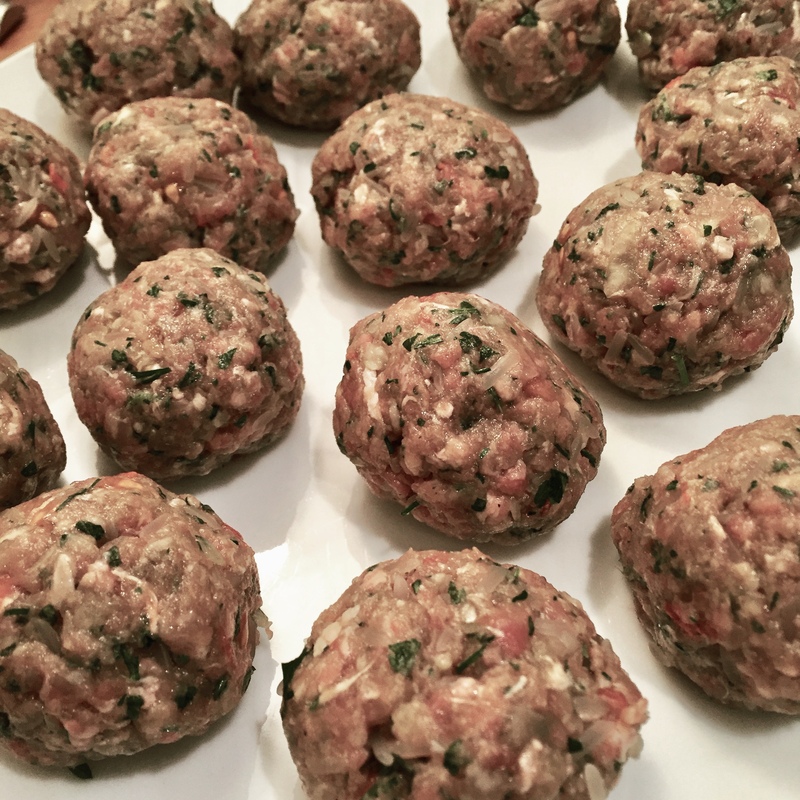 1 whole egg and 1 additional yolk – see the list of ingredients for meatballs. 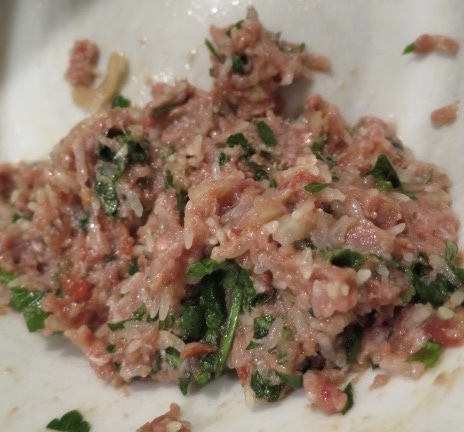 Take a medium sized mixing bowl and put in the mince, the rice, the chopped/grated onion, the chopped herbs and the seasoning. Using a coarse grater, gently grate the outer flesh of the tomato and add it to the mince and rice mix. Hang on to the remaining core and juice of the tomato. Separate the white from the yolk of the egg. Add the white to the mix. Again, hang on to the yolk, you will need it for the sauce. With your hands knead the mince, rice, herb mixture, making sure all the ingredients are well incorporated. Now, shape the mince into smallish balls about the size of a large walnut. Cover them with cling film and put them in the fridge or a cool place while you prepare the poaching liquid. Put the vegetable stock into a medium sized pan add the remains of the grated tomato and bring it to the boil. Turn the heat down so that it is simmering. 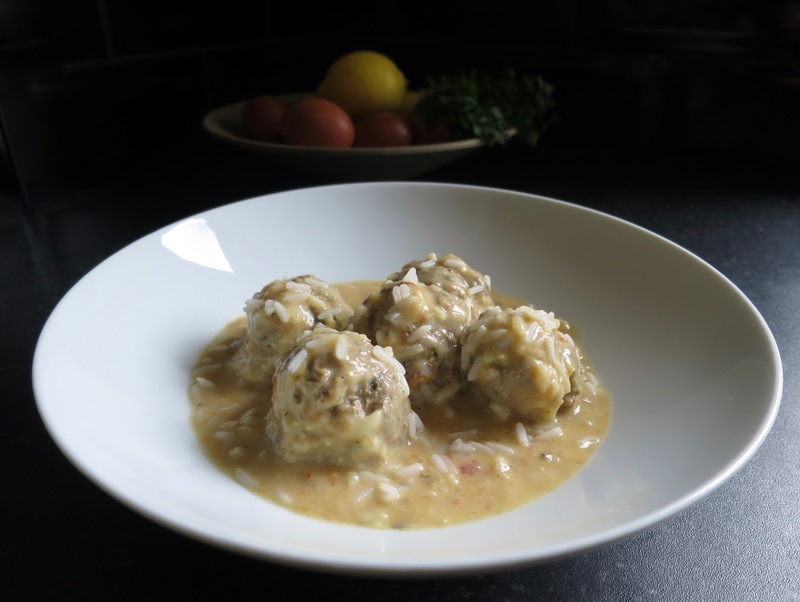 Now take the meatballs – the youvarlákia – and gently drop them, one at a time, into the simmering stock. Put the lid on the pan and allow the youvarlákia to cook for about 35 to 40 minutes, making sure that they don’t boil to vigorously, so they don’t fall apart. If necessary, add a little water. When they are cooked, dilute the cornflour with a few teaspoons of water and add it to the cooking liquid. Stir it in gently, you don’t want the youvarlákia to break. Heat it again for a minute or two, so that the liquid thickens slightly. Remove the pan from the heat and allow it to cool a little. Take a medium sized bowl (it needs to be big enough to take all the poaching liquid) and break into it the the next egg and the retained egg yolk. Give this a good mix with a whisk. Gradually add the lemon juice, a few drops at a time, beating it all the time with the whisk. Now, take a ladleful of the hot poaching liquid and add this very gradually, a splash at a time, to the egg and lemon mixture. You must beat each addition of hot stock very well, so that the sauce doesn’t curdle. Do this until you have added most of the liquid and you are left with just the meatballs in the pan. Now, put the egg, lemon, stock mixture back into the pan and carefully mix it with the meatballs. Return the pan to a very moderate heat and warm it again carefully. If it boils it will curdle. Check the seasoning and also add a little more lemon juice if required. Serve the youvarlákia with good crusty bread. A slice of feta on the side goes nicely too.